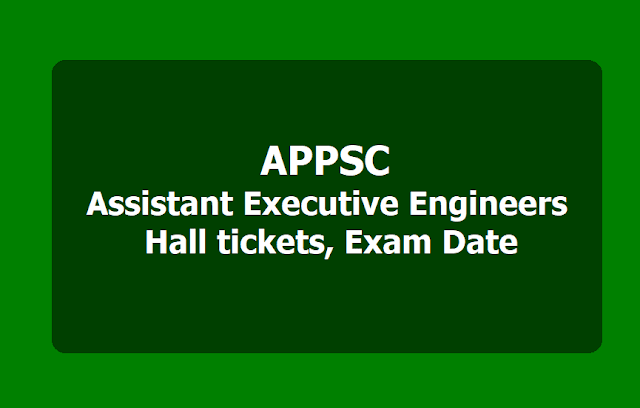 APPSC AEE Assistant Executive Engineers Hall tickets 2019, Main Exam Dates: May 14, 15: APPSC has given a notification for filling up 309 civil Assistant Executive Engineer posts and applications are invited Online from qualified candidates through the proforma Application to be made available on Commission’s WEBSITE (www.psc.gov.in) to the post of Assistant Executive Engineers in Various Engineering Services in the State of Andhra Pradesh. Applications are invited online for recruitment to the post of Assistant Executive Engineers in various Engineering Services for a total of 309 vacancies in the scale of pay of Rs.37,100 - 91,450 from candidates within the age group of 18 - 42 years as on 01.07.2018. The proforma application will be available on Commission’s Website (https://psc.ap.gov.in) from 03/12/2018 to 24/12/2018 (Note: 23/12/2018 is the last date for payment of fee upto 11:59 mid night). Andhra Pradesh Public Service Commission (APPSC) has released the admit card /hall ticket of APPSC AEE Prelims examination on February 8, 2019. The APPSC AEE hall ticket is available on the official website https://psc.ap.gov.in/. Candidates who applied for AEE recruitment examination can visit the official website to check and download APPSC AEE hall ticket 2019 for prelims. The candidates need to enter their user ID and mobile number to access the hall ticket. Andhra Pradesh Public Service Commission (APPSC) has released notification for Assistant Executive Engineer (AEE) recruitment. Online registration for the recruitment will begin on December 3, 2018 and candidates can apply till December 24, 2018. A total of 309 vacancies have been notified by the Commission for recruitment in various Engineering Services. APPSC will conduct screening test on February 17, 2019. Candidates who qualify the prelims will be eligible to apply for the main exam on May 14, 15. Revised Exam Scheduled in Assistant Executive Engineers - Notification Nos.09/2018 - Screening Test to be held on 17.02.2019 instead of 10.02.2019 and The Main Examination will be as scheduled on May 14, 15. APPSC Engineering Services Hall Ticket: How to download? APPSC conducts a screening test if the number of applicants exceeds more than 25,000. Candidates who qualify in the screening test will appear for the main examination which will be a computer-based test. The screening test will have two parts. Part A will be General Studies and Mental Ability and will have same syllabus for Civil, Mechanical, and Electrical Engineering branches. Part A will have 50 questions carrying 50 marks. Part B will be subject specific and has different syllabus for Mechanical and Civil, and Electrical Engineering branches. part B will have 100 questions carrying 100 marks. There is negative marking and 1/3rd of marks prescribed to a question will be deducted in case of a wrong answer. Candidates with Bachelor's degree in Civil, Electrical and Mechanical are eligible to apply for this recruitment. Click here for more details on educational qualification. Applicants must be in the age group of 18-42 years. 5. Department: Civil, Mech, Electrical. 6. Qualification: Engineering Degree (relevant discipline). 7. Age limit: 18 to 42 years of age as on 01.07.2018. 9. Date of online application: 03.12.2018 to 24.12.2018. 1. 309 ఏఈఈ ఉద్యోగాల భర్తీకి ప్రకటన - రాష్ట్రంలో వివిధ శాఖల్లో 309 సహాయ కార్యనిర్వాహక ఇంజినీర్‌ (ఏఈఈ) ఉద్యోగాల భర్తీకి ఆంధ్రప్రదేశ్‌ పబ్లిక్‌ సర్వీస్‌ కమిషన్‌ న‌వంబ‌ర్ 29 న‌ ప్రకటన జారీచేసింది. 2. సంబంధిత విభాగంలో ఇంజినీరింగ్ డిగ్రీ ఉత్తీర్ణులైన వారు ద‌ర‌ఖాస్తు చేయ‌వ‌చ్చు. అభ్య‌ర్థులు 18 నుంచి 42 ఏళ్ల మ‌ధ్య వ‌య‌సు ఉండాలి. 3. డిసెంబరు 3 నుంచి 24 వరకు ఆన్‌లైన్‌లో దరఖాస్తులు స్వీకరిస్తారు. 4. దరఖాస్తుల సంఖ్య 25 వేలు దాటితే .. ఫిబ్రవరి 17న ఆఫ్‌లైన్‌లో ప్రాథమిక పరీక్ష నిర్వహిస్తారు. 5. May 14, 15 తేదీల్లో ప్రధాన పరీక్షలు జరుగుతాయి. 6. విద్యార్హతలు, సిలబస్, రిజర్వేషన్ల వారీగా ఖాళీలు, ఇతర వివరాలు కమిషన్‌ వెబ్‌సైట్‌లో ఉన్నాయి. The main examination in online mode for candidates selected in screening test will be held through computer based test on May 14, 15 There would be objective type questions which are to be answered on computer system. Instructions regarding computer based recruitment test are attached as Annexure - III. In case any paper of the Examination is held in different languages, the candidate has to choose the medium in which he/she wants to write the examination and the paper will be valued with reference to that medium only. Applicants must possess the qualifications from a recognized University as detailed below or equivalent thereto, as specified in the relevant Service Rules, indented by the departments as on the Date of Notification. Applicants must possess the Engineering Degree in relevant discipline. No person shall be eligible for direct recruitment if he/she is less than 18 years of age and if he/she is more than 40 years of age as on 01/07/2019. *As per G.O.Ms.No 295 General Administration (Ser. A) Dept., Dt.23/09/2014 the upper age limit raised up to 6 years i.e from 34 to 40 years. 2. A.P. State Government Employees (Employees of APSEB, APSRTC, Corporations, Municipalities etc. are not eligible). 5 Years based on the length of regular service. The Commission reserves the right to conduct the Examination either ONLINE based examination of objective type. Before applying for the posts, candidates shall register themselves as per the One Time Registration (OTR) through the Official Website for APPSC. Those who have registered in OTR already, shall apply by login to their profile using their APPSC ID and Date of Birth as provided in OTR. The candidates who possess requisite qualification may apply online by satisfying themselves about the terms and conditions of this recruitment. The recruitment test will be in Computer Based Recruitment Method. The objective type question papers are to be answered on computer system. Instructions regarding this computer based recruitment test are detailed in the Annexure - III.